This posts addresses basic on-site Search Engine Optimisation for WordPress based websites. For details on taking SEO for WordPress posts and pages to the next level: click here. On site SEO is about making it easy for the search engines to find your site, to find out what it’s about and to find their way around it. One thing I should make clear before we start, though: do not over-optimise your sites or spend too much time fussing over supposedly important factors like keyword density. Firstly, those factors are no longer important (if they ever were) and secondly you’re focusing on the wrong things. All the search engines make hundreds of algorithm updates each year to improve the quality of the search results they return and to weed out low quality sites. Google, alone, makes around 500 algorithm updates a year. As they improve their algorithms, the search engines are getting ever better at being able to understand the content of a page and to link that with their assessment of the searcher’s intent, which they are doing through increasing use of Artificial Intelligence (AI). Get the basics I’ve set out below in place and then focus on your content. With those thoughts in mind, here are some SEO basics that you should put in place for WordPress websites. There are several Google Sitemap plugins for WordPress. The one I use on all my sites is Google XML Sitemaps. Once you’ve set up the plugin you generally don’t need to do anything more unless you want to change the structure of your site in a way that would affect the sitemap itself. For example, a while ago I decided I no longer wanted my tag pages to be indexed by the search engines so I made them all ‘noindex’ and changed the settings in the Google Sitemap Generator plugin to reflect that. But if you don’t make those kinds of changes to your site the plugin will do its job by automatically re-building itself and notifying the search engines whenever you publish, edit or delete a post or page. So install Google XML Sitemaps (or an XML sitemap plugin) and create an XML sitemap for your site. When you install WordPress there’s a question during the set up process that asks whether you want to discourage the search engines from indexing your site. I usually check this initially because I don’t want the search engines indexing the site until I’m ready for them. However, when you are ready you need to remember to go to your WordPress Settings > Reading screen and un-check the check-box next to ‘Discourage search engines from indexing this site’. That will edit the command in the virtual robots.txt file that WordPress creates and the search engines will then crawl your site when they visit. Installing any of those SEO plugins will give you the option of defining both the site-wide SEO settings and SEO settings post-by-post and page-by-page on your WordPress site. Adding unique META titles, descriptions and keywords to each of your pages and posts will greatly improve their performance in the search results, so install one of those plugins to give your on-site SEO a boost. Whichever of those plugins you use, setting up the Title, Description and Keywords tags will be a similar process. If you have a Google account you can use their Search Console tools free of charge. If you don’t have a Google account you can get one for free and I highly recommend getting it and setting up Google Search Console. GSC provides lots of excellent information for webmasters about their sites and, particularly, any problems that Google finds with them. If you already have a Gmail account then you’re all set – all you need to do is go into your account settings and add Google Search Console. Once you’ve set up GSC and verified your site, and assuming you’ve already set up your sitemap (that I referred to earlier), then you need to enter your sitemap URL and submit it. This will prompt the Google bot to visit your site earlier than it might otherwise do for a new site. When Google Search Console has been active for a few days it will report any problems it finds on your site, which you can then fix. When you’ve fixed them, you can click the button that initiates Google’s validation of your fix and, assuming there are no further problems, your site will have a clean bill of health. I check all my sites and my clients’ sites on Google Search Console each day for any problems – it’s a fantastic resource. H tags are assigned to your headings and sub-headings, and they’re recognised by the search engines as indicators of important information on your page. 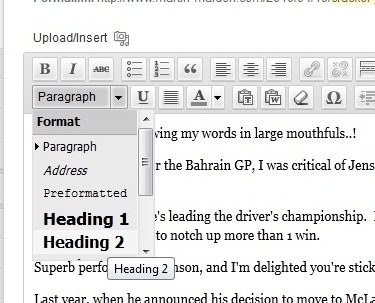 In Microsoft Word they’re the sub-headings that you create by clicking ‘Heading 1, Heading 2,’ etc., when you’re writing a document. It’s the same in WordPress’ Visual View when you’re writing or editing a post (or page). Using headings and sub-headings is an important part of making your posts and pages more readable online. Used correctly, they create a framework for your article over which you hang your words. Importantly, though, as I mentioned earlier, they’re also key indicators to the search engines and play an important part in your on-page SEO. WordPress will assign the appropriate H tags for you, based on the Heading number you select. The screenshot above relates to the WordPress classic editor. The process when using the WordPress block editor, introduced in WordPress 5.0, is described in this article. The search engines cannot read images but you have two ways to tell them what the images are depicting. But it’s not just the search engines: many people have display of images turned off in their browser and you need to find a way of telling them, too, what your images are showing. WordPress makes it easy to add an alt tag – in fact it’s a required field on the screen where you add images. All you need to do is type what your image is showing into the ‘Description’ field when you’re adding an image. Depending on where you get your images from it’s quite likely they’ll have a filename that makes no sense to a human – it’s probably an alpha-numeric file reference! So another way to let people (and the search engines) know what your image is about is to change its filename to something more descriptive. A filename like half-complete-link-address.jpg makes a lot more sense than something like DSC000-018.jpg! Getting those basic on-site SEO steps in place will establish a platform for good on-site SEO for WordPress sites. To take this to the next level you may want to read this post. As I said at the beginning: once those steps are in place, forget about the search engines and write well-researched, well-written and well-presented articles that provide useful information to your readers. The search engines are fully capable of understanding the actual content of a page, and its layout, so that’s where you need to focus your attention. Above all, though, don’t write for the search engines. Ignore them and write for people. It’s people who will buy from you, not the search engines, so it’s imperative that people like your site, share it with others and return for more information. Hi Martin thank you for the post , From the post i have realized that content is the stuff which makes you king in the field of promotion of your website not the other stuff .My main motive is to promote my posts on LinkedIn and grab large number of readers.